Envy what? He said "want", not "went". I don't know why a capital B in the name Debussy jars as much as it does . . . . I was waiting for someone to say that - desperately hoping it wasn't just me! I want to see Pelleas et Melisande performed at Bayreuth every summer. Now you know that will never happen. Set your sights on a goal that has some viability. I have only the Karajan/EMI recording of this work, which I was sent as a wonderfully gracious gift by a GMG forum member. For lovers of the work (they exist: the worldwide web has made public all manner of eccentricities. I confess it does absolutely nothing for me) . . . . In the Opera on DVD topic is a P&M mentioned by T-C, making it almost worth a trip to Vienna next year: Laurent directs it and it's with Dessay, Naouri and the new sensational French baritone Decout. Nothing wrong with loving P+M - there are few works I love more myself. You probably hear a lot of "Wagnerizing" in Karajan's performance because that's precisely how he spins the music. This is Debussy through a Wagner prism. I used to have Karajan's recording and while he makes a case for the work as late romantic, others I feel tend to find more modernism in it. Especially the French recordings from the middle of 20th century, starting with Desormière's pioneering account, to Ansermet, to Cluytens, to Baudo. Each of these have that eminent "French" quality in that they downplay weight and grandeur and emphasize the subtle play of light and shade. Which I think perfectly complements the whispery quality of the libretto. I think if you're looking for a recording to put on the shelf next to Karajan with a suitably contrasting style you can't do any better than Cluytens. The orchestra, the cast, the execution, all add up to highest quality. The sound is mono, recorded in 1956, but it's amazingly realistic and full. FWIW, this is a work I love immensely and currently own five recordings of it (Cluytens, Baudo, Dutoit, Abbado, and Haitink). Thanks much, Donwyn. I just clicked "Complete Your Order". de los Angeles was the kicker. 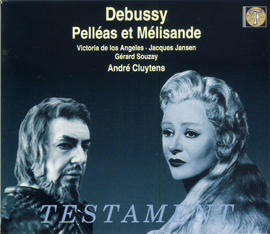 Pelléas et Mélisande is the one opera I have no problem listening to on a whim -- love it! I have the Dutoit recording. "I think the problem with technology is that people use it because it’s around. That is disgusting and stupid! Please quote me." I think you've got yourself a good one, moldy. Yes, de los Angeles is great. Keep us posted! Is the Libretto with an English translation available online? Ah - IMSLP has them, naturally! That translation's pretty dated. Decca used to have the booklet for the Ansermet recording in their "Compact Opera Collection" series online, but I can't find it (the libretto, I can find the recording) at their website. I'll check the recording when I get home and see if the address they give still works. Edit: The Decca libretto is at http://www.deccaclassics.com/compactoperacollection/libretti/. It indicates that the page is not available. I assume you are looking for the libretto. I have had a look around. On-line, I can see the following. However, it is not translated, so I am not sure it is what you want. Thanks for your help. Yes, I was hoping someone who has the Ansermet set had downloaded the libretto while the page was still up. The translation's a bit old and musty ("How old may you be?"). I may have a copy of the libretto from the Decca recording on my home computer. I'll check and see when I get home this afternoon.